We’ve been talking about matters of exit and loyalty as we explore ways to preserve our constitutional liberties. We use the terms secede and secession in this connection, but withdraw and withdrawal are more accurate for our purposes. Withdraw certainly carries a lot less historical freight in our country. It is consistent with the principle of live and let live. It is consistent with the principle of non-violence. It is consistent with the principle of letting each generation decide how best to order its affairs. 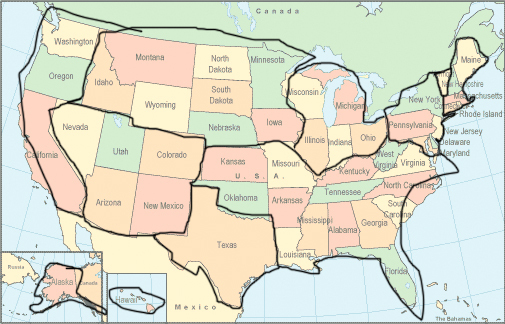 How Will the United States Look If It Breaks Up? You could interpret withdrawal as an act of rebellion in that the whole is not the same after a piece is removed. Still, it does not seek to tear down the whole or replace the established government of the whole. You don’t have to break any eggs to achieve this reorganization – you only need to recognize that each state joined the union voluntarily, and that each state can therefore leave the union voluntarily. Note the root of the word voluntarily. It shares its root with volition. To do something voluntarily means to do it on your own volition. Voluntary withdrawal corresponds to voluntary membership. Involuntary membership implies that the possibility of voluntary withdrawal does not exist. In relations among states, two kinds of argument hold. Force and various types of coercion make up one kind. Persuasion, negotiation, diplomacy and incentives make up the second kind. When you incorporate territory and people in your state by means of conquest, that’s an act of force. Some parts of the United States’ westward expansion resembled conquest – taking territory away from Mexico – but all the states requested to join the Union. They were not forcibly incorporated. If they entered the Union voluntarily, they can leave the Union voluntarily. The Confederate states tried to leave the Union voluntarily, and they were reincorporated by force. Doesn’t that show that states can’t leave the Union voluntarily? What it actually shows is that some states wanted to leave the union so they could continue and extend the practice of slavery. They had poor grounds for leaving to begin with. The Civil War, no more than other out-of-date outcomes in our constitutional history, cannot reasonably or legally determine outcomes in the present. To plan a reasonable future now, we must not look to the Civil War to settle constitutional questions concerning withdrawal. What did the Civil War show? It showed that if a bloc of states wants to withdraw in order to perpetuate and perhaps expand slavery, and the bloc goes to war to enforce its decision, then it cannot withdraw if it loses the fight on the battlefield. It is a narrowly drawn set of conditions that does not apply now. The purpose of withdrawal now is to protect the liberties enumerated in the Constitution, not to preserve slavery. No one would like to see a withdrawing state go to war to enforce its decision, least of all the withdrawing state. Lastly, what kind of democracy is this if you cannot withdraw from it? If you cannot withdraw, that means every member state is part of the union under implicit duress. It also means that one generation, alive two hundred years ago, can bind all later generations of Americans, no matter the later generation’s motivations, goals, challenges and desires. How can that be? Whatever wisdom we attribute to the Founders, however much we admire their work, what claim do they have on us? We have to make our own judgments, as citizens of this republic, about what is right. If we judge that our government violates the liberties guaranteed to us under our Constitution, how can the government appeal to the Constitution as the guarantor of its own misplaced authority? Faced with a choice between protecting Constitutionally guaranteed liberties and preserving governmental authority that violates those liberties, citizens have to choose their liberties, not the sanctioned but illegitimate authority. Let’s consider the practical issue of taxes, the one contact with the federal government that we think about the most. In a democracy, every citizen pays taxes because he or she wants to. When you pay taxes because you have to, it is not a democracy any more. Does that sound like an idealistic way to view taxes? Think about it. In a democracy, we govern ourselves and hire public servants to work for us. We have to pay taxes in order to hire public servants. In that way, we’re like members of a church, where parishioners pledge a certain amount each year to cover the minister’s salary and maintenance of church building. What would we think of a church where the annual pledge was mandatory, and where parishioners were not allowed to leave? We would regard that arrangement as oppressive, and would be happy not to be part of it. We would certainly not consider that church a democracy. So what is more important to us? To preserve the democratic character of our republic, or to enforce membership with coercion or force? What if a majority of people in a state want to leave the union? Shouldn’t the state be able to leave? What if a super-majority – three fifths or two thirds – of people in a state want to leave the Union? How can you defend forcing them to stay? Every argument for mandatory membership implies an undemocratic federal state. Let’s take a look at the original, Latin meaning of the word federal. It comes from foeder for league or covenant. It suggests that independent states form a league by means of a covenant. The states made the Constitution. Moreover, the Constitution grants legal standing to the states, especially in Article V and in the Tenth Amendment. Therefore the states can change the Constitution. If they cannot change it to their satisfaction, they can leave the union. The other states can try to persuade the departing state to stay, but the federal government cannot act independently of the states to force it to stay. If it did use force on its own account, it would be a clear case of tyranny. For discussions about the future of our republic, pointing to the outcome of a Civil War that occurred a century and a half ago isn’t useful. The conditions that pertained for conflict do not apply now. We have to decide the future of our republic based on conditions that pertain now, based on the conflicts and problems that exist now. Most of all, we ought to consider all relevant res0lutions of those problems and conflicts. States that joined the union voluntarily need an option to withdraw. We ought to develop a constitutional, realistic procedure to undertake that action.